Every good story about the sea has, at its heart, the relationship between its characters, their boat and Mother Nature. Our voyage into the protected waters of the British Indian Ocean Territory (BIOT) has been no different and our research vessels, the Tethys Supporter and its three tenders, have been both our best friends and our worst enemies. Like a reef fish waiting for the dangers of the night to pass, I write from my bunk, hunkering down out of the way of the most recent weather to pass through, today bringing lower winds but more swell. I think we all agreed some time ago, that there was something about this particular expedition that was never going to be easy, and so we’ve started to embrace the uncertainty. The Chagos Archipelago can be temperamental at the best of times and we have been getting the full spectrum since we set sail. 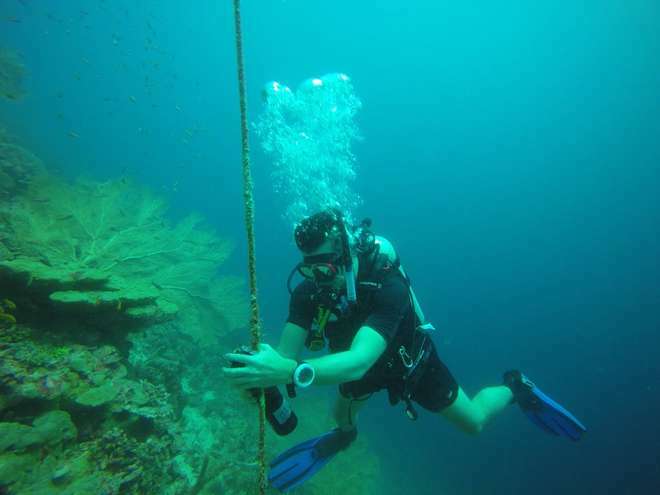 Despite that, the entire team headed up by expedition lead Taylor Chapple from Stanford University, have pushed the limits of workable hours to get as much done as possible and navigating some tricky diving conditions to service a considerable number of our acoustic receivers. While a couple of our more exposed receivers have been lost to the elements, the occasional break in the weather has brought some shining victories. Yesterday, for example, we arrived at Swartz and Sandes seamounts and positioned ourselves over the submerged summit to fish for sharks. At once we found ourselves in a maelstrom of large sharks, the usual suspects but many more silvertips than we’d seen before and even the illusive silky sharks made an appearance. Needless to say, we made hay and deployed numerous tags. 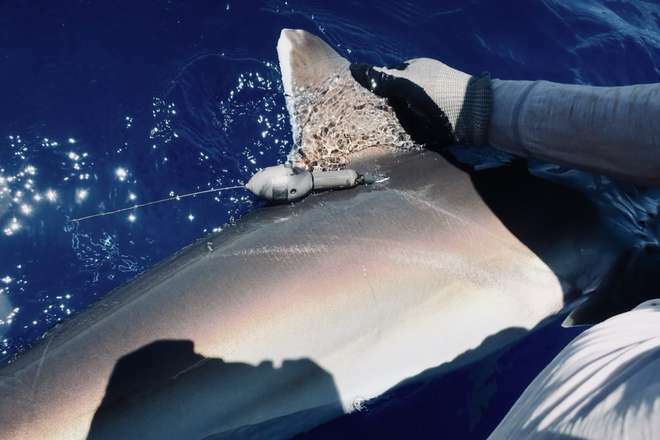 There’s something incredibly satisfying about hand-lining for sharks, knowing that once they leave your boat again, they are carrying the instrumentation that will give you some insight into their lives and movement patterns. In short, they have now become part of the cohort for this ambitious study. That’s the scientist in me getting excited. The kid inside of me just loves being able to get so close-up and personal to these beautiful and perfectly adapted marine predators. And so we move to the business end of the expedition. Everything is now covered in a healthy crust of salt, the majority of the receiver servicing is now complete and over 60 tags have been deployed including acoustic and pop-off archival satellite tags. By chance we’ve had everything but the kitchen sink thrown at us during this expedition and so I feel confident in saying that all things considered this has been a herculean effort so far and we’re still not quite done. For more science updates from the British Indian Ocean Territory, follow @BIOTscience on Twitter. Blog Post: Did curiosity kill the sharks?